Spousal abuse can present itself in varying ways. There is physical abuse, mental abuse, sexual abuse and more. If you faced abuse in your marriage, no one can blame you for walking away. Facing abuse is also a good reason to hire a divorce lawyer. After being abused, you may find it difficult to face your abuser and demand what is rightfully yours. When you hire a divorce lawyer, you do not have to face your abuser alone. Your lawyer will fight for your rights when you are unable to do so. If you are feeling angry, frustrated or hurt during the divorce process, that is understandable. However, those feelings can cloud your judgement and make it difficult to sit down with your soon-to-be ex-spouse for mediation. Then, you will need the help of a neutral party to ensure you achieve the goals of your divorce. If you do not hire a divorce lawyer, you may very likely get caught in an unending cycle of heated back and forth arguments with the other party. When you hire a divorce lawyer, you eliminate having to constantly meet with your spouse to come to an agreement on the terms of your divorce. A Toronto divorce lawyer will help you to create a solid plan which will help you get your divorce to court as soon as possible. Nobody likes doing lots of paperwork. When filing for a divorce, there are many forms to be completed and filed. If there are matters relating to child custody, revision of your will and name change, there will be even more paperwork to complete. Missing information or mistakes on these forms could cause your divorce to be delayed. Luckily, your divorce lawyer knows which paperwork must be filed and can help to ensure everything is done correctly. This will help to prevent unnecessary delays in the process. Do you need the help of a divorce lawyer in Toronto? 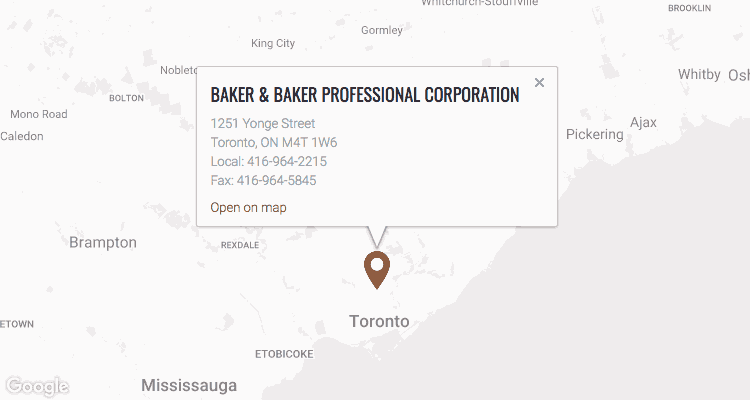 If you are looking for a divorce lawyer in Toronto, contact us at Baker and Baker Family Law. At Baker and Baker Family Law, we know that you didn’t plan for a divorce or to spend thousands of dollars and years of your life fighting with the person you once loved. We understand that going through this process is a stressful time for you. You may find it difficult to separate emotions from practical realities. That’s why we will guide you through the divorce process, using our experience and skills to find solutions that will save you time, money and a great deal of trouble. With a team of 7 lawyers with over 90 years of combined experience, we are in a strong position to help. So, give us a call or email us today to schedule a free legal consultation with one of our experienced divorce lawyers. Let’s discuss your options and how we can help with your divorce.